The new AIA Inter Partes Review proceedings (“IPR”) became effective September 16, 2012. 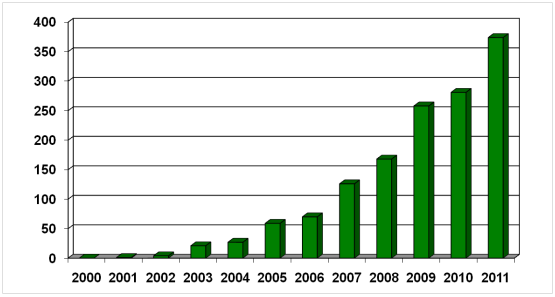 USPTO statistics reveal IPR has been widely accepted with IPR filings steadily increasing. In October 2012, the first full month the new IPR procedures were in effect, approximately 25 IPRs were filed. Less than a year later in July 2013, approximately 75 IPRs were filed – a 200% increase. 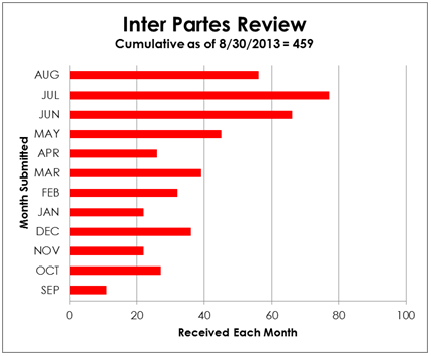 A total of 459 IPRs were filed through August 30, 2013. The rate of IPR filings now greatly exceeds the average filing rates for the old Inter Partes Reexamination proceedings. A variety of factors are responsible for the widespread acceptance and utilization of IPR, including: 1) the expedited nature of IPR (decision required within 12 months of filing); 2) the availability of limited “litigation” style discovery; 3) the express ability of the parties to enter into a settlement prior to a final decision (“put the genie back in the bottle”); and 4) filing deadlines (a defendant in a patent litigation may only request IPR for up to one year after being served with the complaint). In addition to the new benefits afforded by IPR, the traditional benefits of administrative review verses a district court challenge remain, including: 1) significantly lower average attorneys fees; 2) lower “preponderance of the evidence” standard (compared to heightened “clear and convincing evidence” applied in district court); 3) no presumption of validity; and 4) application of broadest claim interpretation (compared to district court canon that claims be construed to preserve their validity). IPR has continued to gain momentum despite the AIA’s adoption of a heightened standard for commencement/initiation of the review proceeding. The old “substantial new question of patentability” standard resulted in roughly 95% of Inter Partes Reexamination proceedings being allowed to proceed. The “SNQ” standard has been replaced by what was intended to be a heightened standard. Specifically, an IPR requestor must now establish a “reasonable likelihood that the requestor will prevail with respect to at least one of the claims challenged.” The initial data indicates a slight decrease in the initiation rate under the new standard. Through August 2013, 87% of IPR petitions filed have been allowed to proceed. Based on one year of data, it appears the USPTO will increasingly become the forum of choice for patent validity challenges. Posted on October 25, 2013, in Patent, Procedure and tagged IPR, Reexam. Bookmark the permalink. Comments Off on ONE YEAR LATER – IPR WIDELY ACCEPTED AND GAINING MOMENTUM.